English as spoken in Britain is a confusing thing at times. U and non-U English usage (the “U” standing for “upper class”, and “non-U” representing the aspiring middle classes) was a curious debate that began in the 1950s. During this debate, it was shown that the upper classes in Britain tended at times to use words that were more common with the working classes than they were with the middle classes. Since the middle classes were keen to use “fancy words” (neologisms that made them seem fashionable and up-to-date) the upper classes sought to distance themselves from this by using ordinary (“common”) words instead! Being “posh” was one thing, but sounding “posher than posh” was altogether “Non-U”. 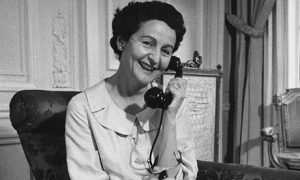 The expression “U or non-U” was coined by the British linguist Alan S. C. Ross, professor of linguistics at the University of Birmingham, and soon afterwards, popularised, in an article and also her books, by the authoress, Nancy Mitford, from the famous family of socialites. Nancy Mitford was one of the renowned Mitford sisters and one of the “Bright Young People“ on the London social scene in the inter-war years, and wrote novels about upper-class life in England and France. What the upper-class were doing was showing that they were, above all, not middle-class! For example, when issuing an invitation, it should be written on writing-paper rather than note-paper (a decidedly middle-class word!). And what about the correct term for the meal itself? Is dinner taken at midday or in the evening? What about lunch and supper? Lunch (or even luncheon) is in the middle of the day and dinner in the evening. To refer to lunch as dinner, or to use the term “evening meal” is to betray your non-U origins! If a dinner guest praises the supper, then the implication is that the meal was insubstantial and unsatisfying. Never issue an invitation to high-tea, as this is an exclusively non-U invention. 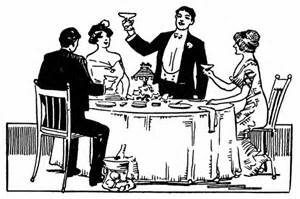 When stating the dress code, don’t use the terms dress-suit or evening-dress, but state simply: ‘We will be changing for dinner’. On arrival, ensure that you praise your host’s lovely house rather than home. When introduced to strangers, the correct response to ‘How do you do?’ is to repeat the phrase. Giving an answer, such as ‘Fine thanks’, is a major faux pas! Linguistic etiquette during the meal is crucial. If you need to wipe your mouth, use your napkin, not your serviette. Never ask for the toilet; U speakers refer directly to the lavatory or the loo. Saying pardon me or sorry is frightfully non-U. Say jam, not preserve; vegetables, not greens; eat rather than dine; have a drink, not a refreshment. Have pudding, not dessert. Partly this was due to the middle-class believing that French-origin words and expressions were more fashionable; but the established upper-classes decided to set themselves further apart by resolutely using the Anglo-Saxon vernacular. In the last few decades, much has changed and it’s far more likely that eating together will be a relaxed and fun event, and not so “strait-laced” as it used to be; and the language we use is far more laid-back. The main thing is just to “be yourself” rather than conforming to a stereotype. As most know, English is a mix mainly of Anglo-Saxon and French words, linked back to Latin. The latter are more elaborate, mannerly and intellectual in sound; the former, more direct and down-to-earth, “calling a spade a spade”. Whereas the common man might say “look into what’s been going on” or “get back to me when you can”, the more erudite person would say “explore recent events” and “please respond as soon as you are able”. In this we can see the tremendous importance in spoken English of verb forms as contrasted with the use of nouns and adjectives in ordinary language. The peculiarity of U and non-U was to allow the upper classes to get away with sounding common! The sometimes hilarious elements of the so-called “British class system” are well illustrated by the much-loved TV comedy series “Keeping up Appearances“; it makes good listening practice too! These quizzes provide a bit of fun if you want to test yourself! You’re so cool! I don’t believe I’ve truly read something like that before. So wonderful to discover someone with some original thoughts on this subject matter. Seriously.. thanks for starting this up. This web site is something that is needed on the internet, someone with some originality!